If your teeth hurt when you chew or if you notice bleeding when you brush or floss, you’re probably suffering from gum disease. This is a serious medical condition that requires immediate medical attention from a dentist. The longer you allow your gum disease to go untreated, the more likely it is to seriously damage your smile. Eventually, gum disease can lead to the loss of teeth. Fortunately, Dr. Cederbaum features effective treatments for gum disease. But gum disease doesn’t just threaten your smile. Recent research also links gum disease to a number of serious health issues including strokes, heart disease, diabetes, and Alzheimer’s disease. Gum disease is a bacterial infection that afflicts almost half of Americans over the age of 30. The bacteria which causes gum disease feeds on the plaque and tartar in your mouth. The best way to protect yourself against gum disease is to prevent the growth of plaque and tartar through daily brushing and flossing and by visiting Dr. Cederbaum for regular checkups. Gum disease is also referred to as periodontal disease. Gingivitis is an early stage of gum disease, when symptoms such as soreness and bleeding begin to emerge. This is the best time to treat your gum disease, before it has a chance to progress to a more hazardous stage known as advanced periodontitis. At the advanced periodontitis stage, the symptoms of gum disease are extremely harsh. The patient’s gums become bright red, swollen, and sensitive to the touch. Eating is extremely painful and your breath becomes very unpleasant. Large pockets of infection develop around the base of the teeth, causing the gums to pull away. This makes the teeth appear as though they’re growing larger. Bleeding is common and pus emits from the gums. As the infection spreads to the jawbone, your teeth will become loose and slide around. Eventually, your teeth will begin to fall out. The good news is that Dr. Cederbaum offers treatments for gum disease at all stages of its development. At its earliest stages, gum disease can often be arrested through a combination of extensive plaque removal from our hygienist and regular home care. 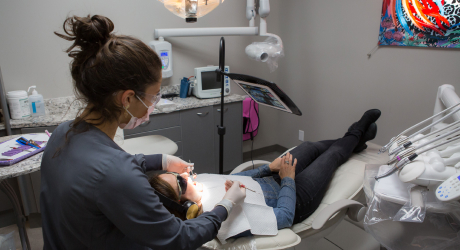 For more advanced cases, Dr. Cederbaum provides a treatment called scaling and root planing which is often referred to as a “dental deep clean.” In this procedure, tartar and bacteria are removed from pockets beneath the gumline. Dr. Cederbaum also provides surgical treatments for the most advanced cases of gum disease. Another effective treatment is the application of Arestin, a time-released antibiotic. Arestin remains active for an extended time, which allows it to reduce the infected pockets around the base of the teeth. Please call our office or fill out the form below to arrange an appointment with Dr. Cederbaum if you think you might be suffering gum disease. The sooner you seek treatment, the better.